Some of the signage on the front of the building, highlighting the exhibit. On June 29th, 2017, the Alphawood Gallery, in partnership with the Japanese American Service Committee (JASC) was glad to announce the opening of their first original exhibit “Then They Came For Me: Incarceration of Japanese Americans During WWII and the Demise of Civil Liberties.” This exhibit ran for approximately four and a half months until November 19th, 2017. Founded as an initiative of the Alphawood Foundation, the Alphawood Gallery approached the JASC in March, 2017 regarding the development of an exhibit on Japanese American incarceration and resettlement that could not only speak to the lessons of history, but also to the contemporary challenges facing America today. Through a rapid process of development, community leaders, JASC and Chicago Japanese American Historical Society representatives, and Alphawood Gallery staff, pursued an aggressive timeline of roughly three and a half months to develop this unique exhibit with an unprecedented speed for an exhibit of this size. The exhibit space covered two floors and the entirety of the gallery space. This exhibit was built upon images of the Japanese American incarceration process taken by Wartime Relocation Authority (WRA) sponsored photographers such as Dorothea Lange and Ansel Adams, as well as photos by noted Japanese American photographer Toyo Miyatake and illustrations by Mine Okubo. In terms of the physical items in the collection, the majority of the items and documents came from the JASC archival collections, helping to expand on the full story of incarceration and its human impacts. Of particular note is the special emphasis of the exhibit on the history of Japanese American postwar resettlement in Chicago, and the unique impacts of the sudden growth of the Japanese American community from a population of around 400 people to roughly 20,000 in the postwar period. Beginning of exhibit section addressing postwar resettlement history in Chicago. 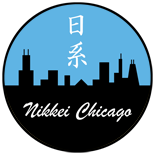 Chicago’s Japanese American community is unique in postwar history, due to the way in which it was almost entirely formed as a direct result of the incarceration process. Through a focus not only on the tragedy of incarceration, but also on the lingering impacts of resettlement, this exhibit allowed the Chicago Japanese American community to address historical wrongs, engage with contemporary issues of Japanese American identity, and question other concerns in today’s politically charged environment. The need to address current issues remained a key theme in the programming developed by the Alphawood Gallery. For example, Japanese American community members, including those who had directly experienced the camps or who had family in the camps, were invited to the gallery space in order to share their stories in weekend sessions. In addition, a diverse range of community voices were brought together in the programming as a way to expand the story of Japanese American incarceration into a larger arena. Film screenings, workshops, panels, and artistic performances all highlighted the importance of addressing contemporary controversies regarding immigration, the Muslim Ban, and other civil and human rights issues. Highlights of the programming included a special visit and public talk by actor and activist George Takei, and a talk by Tom Ikeda, founder of the Densho project, which is dedicated to educating the public about issues related to Japanese American incarceration. Panelists at the November 18, 2017 closing weekend Hate Crimes Panel, featuring from left: Panelist Helen Zia, Comedian Arish Singh, moderator Ryan Masaaki Yokota, and panelist Pardeep Kaleka. A special closing weekend panel on hate crimes on November 18th, 2017 included a discussion with Helen Zia, noted Asian American and LGBTQ activist, who had played an instrumental organizing role in the 1982 Vincent Chin case, which involved the murder of a Chinese American in Detroit, Michigan at the height of the 1980s Japan-bashing era. Additional panel member Pardeep Kaleka discussed how his father had been killed in a vicious white supremacist attack on a Sikh gurdwara in Oak Creek, Wisconsin in 2012, and how he has worked to overcome issues of hate and extremism in the community. Other closing weekend highlights included a special performance by Tsukasa Taiko, and also a closing night performance by Ho Etsu Taiko, which featured a new song on the camps written by Emily Harada, and performed by the group. Friends and supporters of the JASC attend a tour talk at the “Then They Came For Me ” Exhibit at the Alphawood Gallery on August 11th, 2017. Throughout the many months of the exhibit, roughly 21,000 people attended the exhibit, including visits by U.S. House of Representatives Minority Leader Nancy Pelosi, U.S. Senate Minority Leader Chuck Schumer, and numerous tours from neighborhood schools and other community institutions. This story was previously published in the Winter 2017 newsletter of the Japanese American Service Committee Newsletter. This entry was posted on January 18, 2018 by R Y in Community, Family, Japanese Latin American, Politics, Redress, Resettlers, Uncategorized, Veterans, World War II and tagged Alphawood Foundation, Alphawood Gallery, Ansel Adams, Chicago Japanese American Historical Society, Chuck Schumer, Dorothea Lange, Emily Harada, George Takei, Helen Zia, Ho Etsu Taiko, Hyde Park, Internation Center for Photography Museum, Japanese American Service Committee, KAM Isaiah Synagogue, Michael Takada, Mine Okubo, Nancy Pelosi, Pardeep Kaleka, Ryan Yokota, Then They Came For Me, Tom Ikeda, Toyo Miyatake, Vincent Chin, Wartime Relocation Authority.